Aniket is a Happy Kuverian. 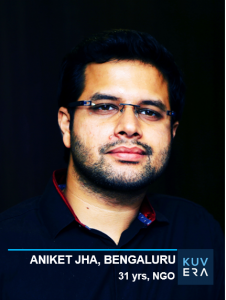 He manages a 70 person strong NGO started by his father and lives and works in Bengaluru. 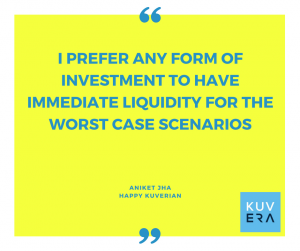 We spoke to Aniket about his experience with Kuvera, India’s friendliest Direct Plan Investment Platform. Please tell us about yourself, where did you grow up and your story? I am from Bangalore. Have lived here for 31 years now and have seen this city evolve to Bengaluru all through. My parents came to this city when dad migrated for work as a journalist and later as Chairman of Karnataka & Andhra Pradesh for one of India’s largest social service organization (Sulabh International). I did my formal schooling at Bishop Cotton Boy’s School, followed by my graduation at M.S. Ramaiah College and master’s at Manipal University. Currently, I live with my mother. I have a younger brother who is based in Hong Kong pursuing his Bachelor’s there. Professionally, I have been in a few jobs for the last 7 years across different sectors, while currently, I take care of my dad’s NGO where we have a workforce of over 70 people. 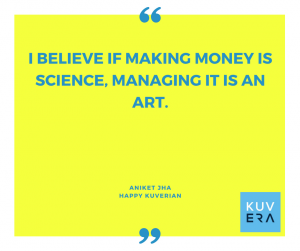 I believe if making money is science, managing it is an art. There are ways to make money, but managing it tactfully across a plethora of saving and investing avenues available is a real challenge and require a lot of thinking (a lot of ‘Why?’) before getting into the actionable. People – My mother’s requirements, family extension plans, brother’s study. Situations – I have built three layers of financial security to handle my situation after the worst tragedy possibly, which struck us last year. Layer 3 – Investments. Capital appreciation for future needs and luxuries. In fact, I have started exploring Layer 4 which I will bring in the next 12 to 24 months (for my retirement by 35) – Stock trading….but that’s after I have sorted the Layer 3 to a level and have brought the current business into a self-sustenance mode, rather than the regular firefighting. How did you learn about Kuvera? I will be honest with you on this. Thanks a million to the founders of Arevuk Advisory Services and Google for building something so unique, comprehensive yet consolidated and making not just life but ‘living with responsibilities’ so easy. I think more than the customers of Kuvera learning about them; it’s the founders who understood that people needed something like what they have built and are evolving further. If they had continued their ‘cushioned corporate jobs’, I can’t imagine today how challenging my life would have been from investment point. How were you investing in Mutual Funds before? Did you know about Direct Plans before Kuvera? Making money out of money – I always had the fascination for this, what I didn’t have was the money to start. I always used to read a lot on mutual, stock and scroll through money control, ET and sites of various AUM companies. However, my first investment was through a bank, as they had an ELSS fund. Initially I was happy, knowing that my investment was not through a broker, hence my selection of the Axis LT Equity was direct, but I received a shock when I got the documents. The bank had made the investment into a ‘regular’ plan than ‘direct’, though I had directly reached out to them. It was only a year later when responsibilities struck hard, and I learnt about Kuvera through one of their blogs (as part of my reading spree) that how much would I be losing on the commission and how easily as my trusted banker had hurt my trust by playing as a broker. That’s how I started investing. Today, however, that first tiny investment (of 3L) has now reached 4.2L in a matter of 15 months, still going strong under the lock-in. Would have been better if it was under ‘direct’. Why do you invest and why Mutual Funds? Given the scenario in India, and being a young care taker of my family today…I will rather trust my assets in the hands of an organized, controlled and researched asset management company/fund, rather than invest or stay invested in a fixed asset (i.e. land) which has too many paper works, requires generations for value appreciation and lacks transparency from the socio-economic – legal – political clout. Also, I prefer any form of investment to have immediate liquidity for the worst case scenarios, coupled with consistent returns if possible. (I.e. Investing 70L in an apartment would fetch me 20K rent pm + maintenance. This would give me 2.4 L pa return at an average with no immediate liquidity. While investing the same amount in an aggressive balanced fund will give me 12% returns…that is 8.4L per annum or 50K per month via dividend or growth. Risks are everywhere. Be it a mutual fund or the apartment building itself). If my MF’s aid in development of my country in form of investment and taxes (10% LTCG) along with further growth to my corpus, there’s no harm. It’s a win-win for all right? I mean this. There was a time when I wished if Kuvera had a certain feature, but today within one year, I have lack of time to look into all the features which are already up on their platform. Kudos. Each time I get a notification email stating that a certain feature has been added…I have just two words – oh wow. What were the biggest problems that you have faced with investing and financial planning in India? While yes, it’s a general perception that people need to make time, but my situation was different. It was just one fine day, we lost dad and all hell broke loose in handling people, processes and money, coupled with the daily life in a job back then. The uncertainty was sudden and the pressure immense. 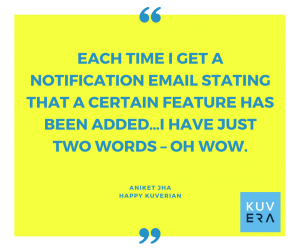 Can you describe your experience with Kuvera? Today, Kuvera is just not an app, a piece of technology or a platform where I invest through. 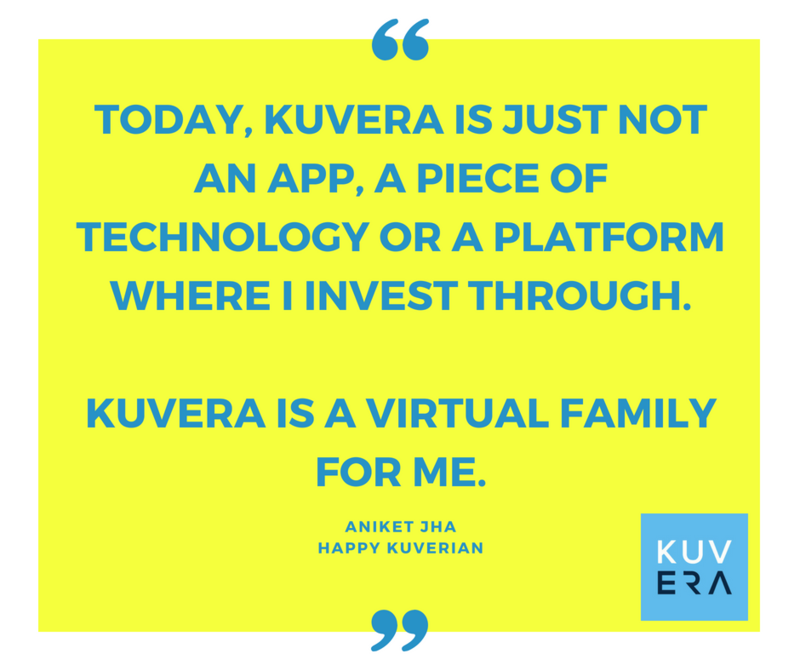 Kuvera is a virtual family for me. It’s my pathfinder. My dad never knew about mutual funds so he wasn’t the one I could go to for guidance on this. He had his traditional ways of doing things i.e. LIC. But today, even in his absence, I have someone to learn, invest, earn, grow and going forward to rely on by creating a fixed income for ma (swp) in the coming few months. What more can I say? What goals have you planned for? To liquidate the limited assets and make them more efficient and secure in terms of management and returns. Ensure to utilize the power of compounding (for next 25 years) on the existing corpus and my savings via the regular SIPs for a better future on the family expansion plan taking place by the end of the year. How did you choose which schemes to invest in? Will you recommend Kuvera to your friends and colleagues? I have a created a solid portfolio of 3 Equity oriented schemes + 1 Liquid Fund + 1 Ultra Short Term Debt fund. As my current fund selection is for 7 – 10 years I have selected the following schemes under equity – 1 Multi-cap, 1 Value Fund, 1 Thematic (and 1 Contra fund, yet to decide) under reputed asset management companies like Tata and Kotak. Also, all my previous investments will fall into these once their lock in periods is over. The reason I did not opt for a small cap or a mid-cap fund directly is due to the fluctuations which are volatile and also that the corpus I am investing is all that my father left us for our family. Hence, I opted for medium risk – medium / high returns. It was ok for me to compromise on returns by a few %, considering the volatility and risk factors. About recommending Kuvera, I already have two accounts (one for my mother, one myself). I have also encouraged my fiancée to start investing in liquid and short-term debts rather than bank RD’s. Few of my colleagues/network people have come to know about Kuvera through me…and to add it in future, it would be my pleasure to introduce Kuvera to anybody who is looking at building long-term wealth (after all, Kuvera is a virtual family to me today).